If this Fairy was aligned with Moonlight: Then her powers would grow with the “Cycle of the Moon”. Perhaps her powers would be associated with the “Pull of the Moon” – as it “drives” the Oceans of this World? Then could this Fairy be seen as a “guiding light”, as she helps a ship at Night! If this Fairy was aligned with just the Night: Then her powers may be linked with other so-called “Creatures of the Night” – such as the eternal Vampire, or the illustrious Werewolf? Then could this Fairy be steeped in mystery, as she flies “like a bat” through the sky. Yet, if this Fairy was aligned with both Moonlight and the Night: Then would you have an Elven Queen – who’d shape the Foundries of your Pillow! When you “settled down to sleep”, within this “Kingdom of the Night” – you’d find her midnight tales of “Story Time”. Perhaps as I flicked through the Fairyland pages of a night-time tale: I’d learn something of the “Powers and Nature” of this Fairy. Would she be a tale of Storm: a Thunderstorm that cuddles you – this Night? Or would she be a starry sky: with Dreams and Thoughts that twinkle – in this Night? Perhaps then would your Dreams, guide you this Night. A dazzling Fairy Queen, who beckons you – in the Fabrics of the Night! Dressed in Black, with Darkened Wings – a Gothic Queen, who speaks to you – this Night. 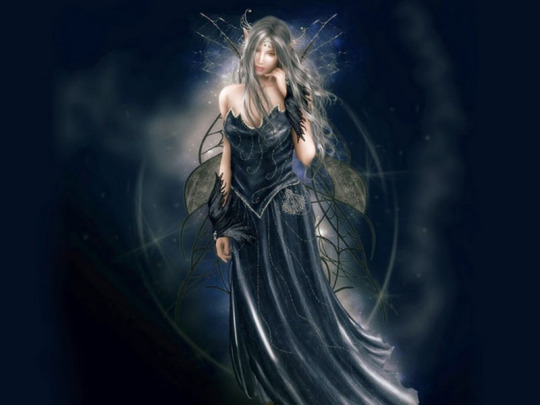 This entry was posted in Fantasy Fairy Art and tagged fairies, fairy, fantasy, full moon, gothic, moonlight, starlight. Bookmark the permalink.